Just a heavy piece of cardboard, some scraps of yard, a crochet hook and glue provided some fun today! I crocheted some chains in different lengths (actually the girls told me what color and how long). If they were older it would have been fun to have them crochet their own chains. They put glue on the cardboard. 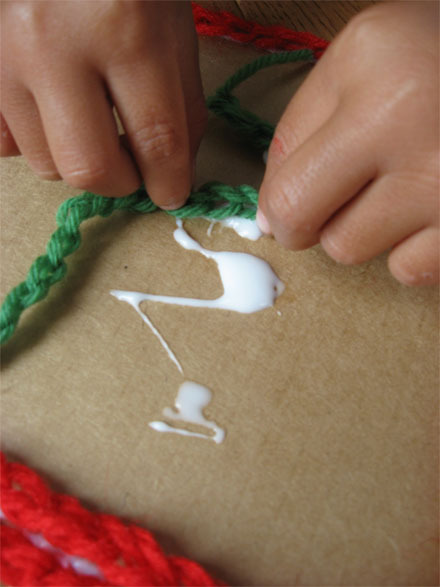 Then they expertly arranged the crochet chains on the glue. I think this activity would be great for older (Kate and Bella are 4 1/2) children too! It would be easier for older children to fill in the whole space and it would also provide a fun way for them to practice crochet skills. What a fun project. Thanks for sharing!! I did this with my girls (6 and 8). They love to make chains and this was a perfect way to use some of them up! The 6 year old LOVES chians and actually made about 60 feet of it for some "jungle vine" decorations! She was so proud of herself. We also have wrapped chains around cardboard wreaths. Thanks so much for the fun idea - it was a hit! This is perfect for beginners! I work for a summer day care program, and last year I tried to teach the kids how to crochet. Most of the kids mastered the first chain step, but burned out quickly after that. This will be a fun way for them to USE the chains rather than just making never ending chains that have no use. What a beautiful way to this would be for the children to to use the chains that they finger knit. I have been racking my brain trying to come up with ways for them to use the chains they make besides making belts and necklaces. As far as finger crocheting goes, I do it regularly with the children I work with (I am a Montessori teacher). I have seen children as young as 4 be successful with finger knitting. A wonderful tutorial that I found for how to teach them is http://www.youtube.com/watch?v=xMQr_nLn4FM. What a wonderful idea! I often teach my friend's children how to crochet...this is a wonderful idea for the younger children! Gracias, por tan hermosa idea. Es fácil de realizar en especial con los más pequeños y pequeñas que apenas comienzan elaborando cadenetas, y que al tiempo le dan libertad a su imaginación en el uso de las mismas. Yolanda. This reminds me of Huichol yarn paintnig. I have done similar projects with 5-6 and 7-8 but never using finger knitting/ crocheting to provide a new level of dimention. Thank you for the idea! Brilliant idea - we have thirty million miles of finger knitting and only so many tiny toys need scarves!!! Love it! I'm thinking this would be a great road trip project for my 3yo daughter, but using sandpaper to stick the chains onto instead of the cardboard (saving unsupervised backseat glue usage, of course!). Thanks for the idea! That is so cool!!! I will definitely be doing this with my kids. Maybe we'll do it again at Christmas time too. Thank you! What an excellent idea. I am really looking forward to trying this with my 5 year old daughter!!! 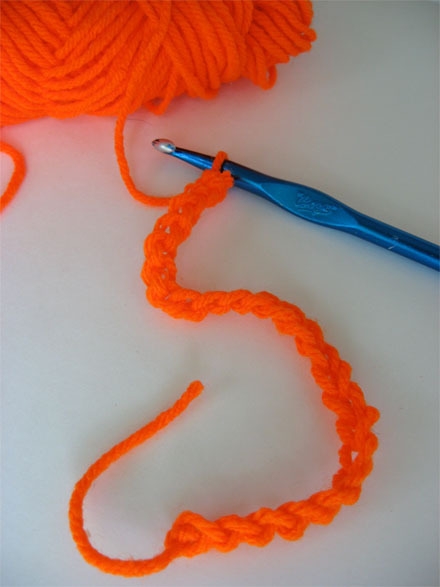 Have you ever tried finger crochet? They can make chains without a hook. The children in my class have made very long chains this way. The mosaics are a great idea. I certainly can not wait until i can make it to the yarn store to do this with my kids! Thanks a million! I will certainly give credit to the Idea when I post! Oh how adorable!!! I'm gonna have to try this one very soon! This is a must try for the Ray family! Thanks for sharing! The girls will love to do this project. Now we can use all those long chains the girls crochet. Darling project! We might need to do this in my girls class! 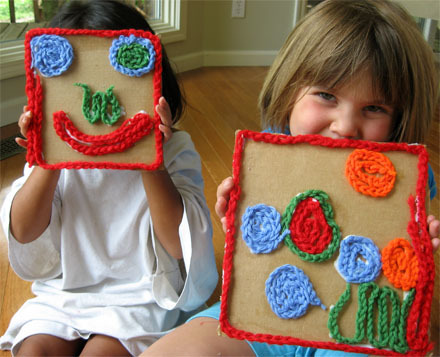 Love those little smiling faces - and oh, yes, the cardboard ones too! Very cute -- what a great mom to crochet miles of yarn! Fun! I've been wanting to teach my 8 yr old to crochet. This would be a great first project to learn the chain stitch! Wow, how creative is that? 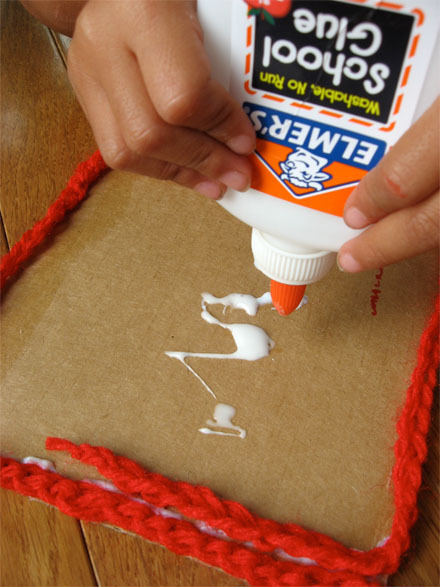 What a great activity for kids, and also a wonderful way to use up yarn scraps.